I got my first 600k!!! Long time coming! Raul_1138 on Twitch and Discord. NTSC Tetris : Played on hardware with a real controller. DLo, DivCaste and Qlex like this. BenMullen, Svavar, Raul1138 and 1 other person like this. @Kitaru Hey there, from what I understood, Mr. Louie Skouie was going to be working on updating the leaderboard, thus the format of my last couple PB posts. Is that still a thing he's working on? Just curious, as this was a while ago and I haven't really heard anything since then. 528.366 is my actual record here, done in Portland at CTWC. Was the first time playing on an original console. Only got a NES Mini, which is actually a very bad Emulator. Gonna take some time until I can try to improve my score because lv19 is unplayable on the Mini console. Svavar, Qlex, Archina and 1 other person like this. wasmachstdugern, DivCaste, BenMullen and 6 others like this. Post transition game play was the deciding factor. 425k transition. Year end goal #1 completed. I got my second 600k! DLo, DivCaste and CylinderKnot like this. That was a fun game to watch. Thanks for sharing! Finally got a score I want to show off, PB raise by >100k and level PB as well. Done on emulator, level 18 start. Very nice! Level 18 start? Big leaderboard update, had to input a couple of pages. Thanks to everyone for their submissions, and thanks for so many well-formatted posts with start/end levels + lines. Let me know if anything was missed or needs adjustment. If possible, it also helps a ton to get pre-max score/line and post-max line. I don't enter the fractional lines by hand at the moment, I just add those three numbers to a spreadsheet and let my scoreboard script calculate fractional lines. Qlex, DivCaste and Raul1138 like this. @Lastarot_Qc Got a weird 404 error where the link should be. Right On! I remember you saying that you had got the 633k. All-time personal best is 825,000, but that was 25 years ago! I only just started playing again and so I feel it’s more fair to put up my current numbers. 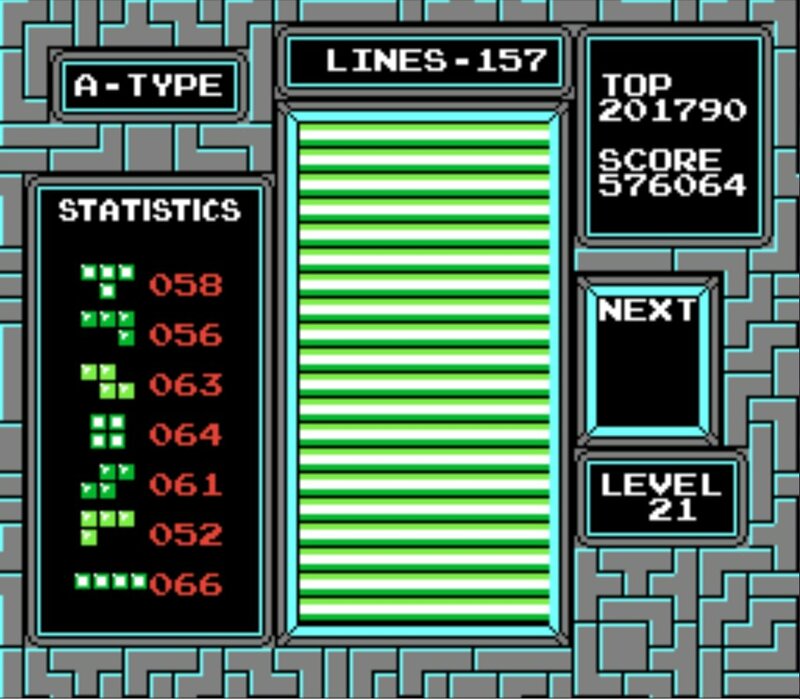 That said my current PB is 613,400, 156 lines into level 21. Thanks! Icefox, FreakyByte, DivCaste and 2 others like this.